I was looking for an easy dinner recipe that didn’t come out of a box, and that I would make with ingredients I actually had on hand. I’ve had this recipe pinned for some time and it instantly came to mind when I was deciding what to make for dinner. I typically add my own spin to most recipes that I try, and this one was no different. Thankfully its versatility allowed me to do so. This recipe was remarkably quick to prepare (including a quick defrost of the fish), used very few ingredients (with little mess), and was a hit with all 4 of us! Win – win! The tilapia was tender and moist, and the topping was flavourful with just the right amount of crunch. 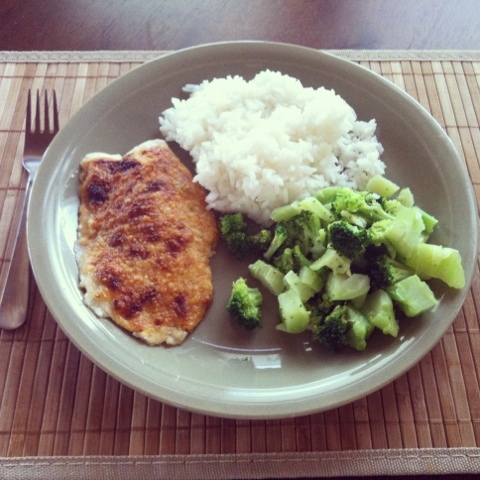 I paired this delicious white fish with rice and broccoli, but would complement just about any side. The prep time for this recipe was minimal as there’s only 9 easy ingredients, none of which required any real effort. The entire time to make this dish was about 20 minutes start to finish, and that includes thawing the tilapia filets that I had! I seriously recommend you make this, especially if you like cheesy, creamy, crunchy goodness. It’ll please even a non-fish liker! When fish is done, take out of the oven and switch oven to broil. Spread cheese mixture on to of fish, sprinkle bread crumbs on top and broil until golden brown and slightly crispy on top, about 3 – 5 minutes. note: Make sure you watch the fish well when under the broiler. The crust will brown very quickly and you certainly don’t want it to burn!